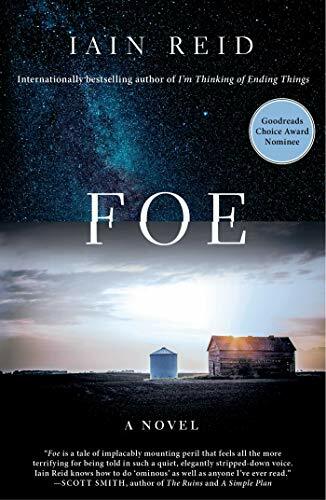 Iain Reid’s (I’m Thinking of Ending Things) sophomore novel, Foe explores relationships, human nature, and isolation in a psychological thriller set in the near-future. Reid’s prose is sparse and punchy, and he masterfully pulls you in from the first page. Married for seven years, Junior and Henrietta live a solitary life on their isolated farm far removed from city transformation. Junior describes it best, saying, “My youth was unremarkable, unmemorable. We all occupy a social district, and I had my place: middling, undistinguished, irreverent.” These thoughts seemingly parallel the marriage until one night, Terrance, a mysterious stranger from the city, shows up at their door. Terrance, a representative of OuterMore, an outer space developer that has a branch within the government, delivers the joyful news to Junior that he has been selected for the long list, the lottery for The Installation for the first wave temporary resettlement in outer space. Terrance is giddy and insists that it’s a “chance of a lifetime” and for the betterment of society. But Junior is suspicious of him and the organization, and worries about leaving Henrietta alone while living years in space. Terrance assures Junior that OuterMore has taken care of everything and plans to give Henrietta a stand-in—a duplicate companion while Junior’s away. From here we see Junior, Henrietta and Terrance prepare for Junior’s journey to the resettlement. As the days go by, the tale turns menacing and truths unfold.